It's Autumn, and that means it's time for everyone I know in the art/DIY world to switch out of Con Mode and into Holiday Mode. Yes, it seems early for Christmas, but every November I have to turn frantic last-minute customers away, which makes me very sad. It's not that I don't WANT to create a custom gift for you, it's that my technique takes time (especially in cold, damp weather). Add to that the fact that there are about 10 others begging me to "just do one" for them, and you see the problem. Scroll down for Thanksgiving sale info and holiday order deadlines. In the meantime, I'm trying to entice you all into ordering a little earlier this year; therefore, I offer you an early bird sale. I am giving an unheard of 15% discount to folks who order custom paintings/boxes early! Now through September 30, all custom work is 15% off. These items will not be on sale over Thanksgiving weekend (which is past the custom order deadlines listed below anyway), so don't wait! These dates may be changed as my schedule fills up. The more orders I have, the earlier the deadlines become. Those who order first will receive first priority. October 28 (Monday) - last day for US orders on custom acrylic on wood paintings and all sizes of custom boxes with original designs and custom mixed-media on canvas panel pieces. 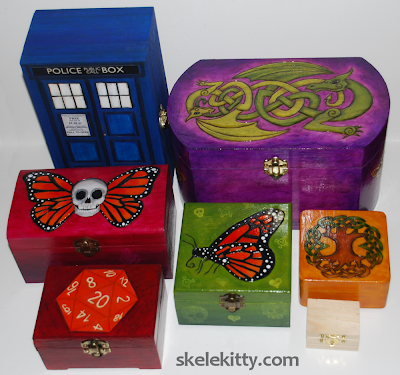 November 4 (Monday) - last day for orders (US) on small art and boxes with duplicate designs (i.e., remaking an existing design like painted sacred heart sculptures the TARDIS or boxes in the "Gallery" section of my shop. Includes duplicates of hand-painted wooden bangle bracelets). Coupon codes will be provided for the sale and cannot be combined. I am happy to combine shipping on separate orders placed over the weekend, and will automatically refund extra shipping charges. 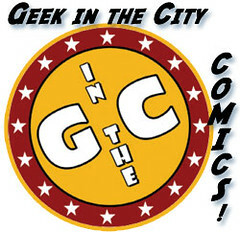 Since custom art and boxes will not be on sale, I strongly recommend that you get your custom order in now. Just take advantage of the early bird sale, why don't ya? 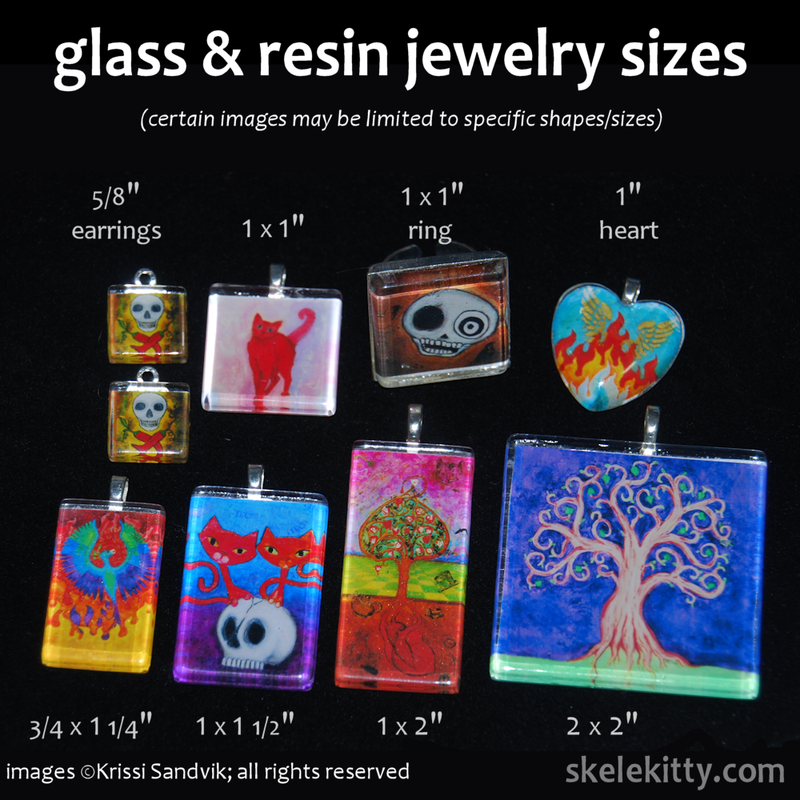 Please check your browser's compatibility with my shop, skelekitty.com. Over 95% of my customers fly through the shopping process with no problems, but occasionally someone has an issue. Why? 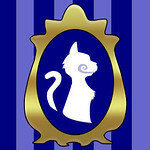 The system on which skelekitty.com runs, (Goodsie.com) no longer supports some older browsers including, but not limited to Safari 4 and Internet Explorer 8. Updating your browser or switching to a different browser altogether may resolve your issues. Have you updated Internet Explorer but are still seeing a blank page? Look for the blue compatibility issues icon and click on it. If you are using the current browser version (Chrome and Firefox are recommended), but continue to have problems, please contact me with your OS/browser/version and details and I'll forward the information to Goodsie. I am happy to send PayPal invoices, however, please note that absolutely no invoices will be sent during the Thanksgiving weekend sale. Please don't wait for the order deadline or Thanksgiving sale only to determine that your firewall or browser version/settings block my site. Seriously. Please don't wait for Thanksgiving, since I'll be out of town with no internet connection. You'll miss out on the sales, and we will both be sad. * order = payment and all requirements. Your order must be completed, including work requirements, by September 30th to qualify for sale. Paid orders without requirements will be refunded on October 1. *** custom work = all custom and made to order paintings (acrylic on wood and pastel on canvas panel), wooden bangle bracelets and trinket boxes (all designs), if I have to paint it before I send it to you, it's "custom"; does not include glass & resin jewelry. These deadlines are for Christmas delivery in the US. International customers are responsible for determining shipping times to their country from California. I do not set deadlines for international shipping as each country's customs procedures are different. For delivery by Hannukah, add one month to the dates listed (e.g. September 14 is the deadline for custom work desired by November 27). 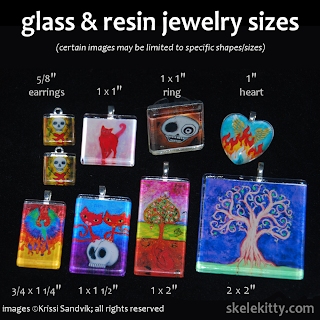 absolutely no PayPal invoices will be sent for Thanksgiving weekend sale items; all purchases must go through skelekitty.com (please update or change your browser well in advance of the sale).